AzhwAr tells his heart not to get bewildered that there are many entities in the world that one can hold on to. Once we understand our connection with emperumAn, the heart will understand him on its own and hold on to him. He says that for those who have faultless devotion towards him, it is impossible to wait patiently for him to come to them. theLidhAga uLLaththaich chennireei – establishing the heart such that it attains clarity. Removing the bewilderment in worldly matters and establishing the heart in the one entity (emperumAn) that is of importance to it. sem nireei – instead of controlling the sensory perceptions by trying to win over them, involving the sensory perceptions in matters related to emperumAn and win them over. In other words making the heart to have the ability to distinguish [between good and bad], to be free from sensual pursuits [desires for worldly matters] and to be humble. gyAnaththeLidhAga nangu uNarvAr sindhai – the knowledge that is born in such a purified heart is bhakthi (devotion), says AzhwAr. With the aid of that bhakthi, people will be able to feel him clearly through the methods ordained in SAsthras (sacred texts) – through Sravanam (hearing about emperumAn) mananam (thinking about him) and nidhidhyAsanam (meditating continuously about him). The heart of such a person would be able to see him clearly as mentioned in muNdaka upanishath 2-2-9 “thasmin dhrushtE parAvarE” (if that supreme entity who is above everyone else is seen). gyAnaththu eLidhAga – once the heart realises this, it will be able to hold on to emperumAn just as it is holding on to all the worldly matters now. thAy nAdu kanRE pOl – if a calf is let out towards a herd of cattle, it will avoid all other cows, identify where its mother is and go towards it. In the same way, the heart will also avoid all other entities who appear superficially to be the ones to be held on to and hold on only to emperumAn. 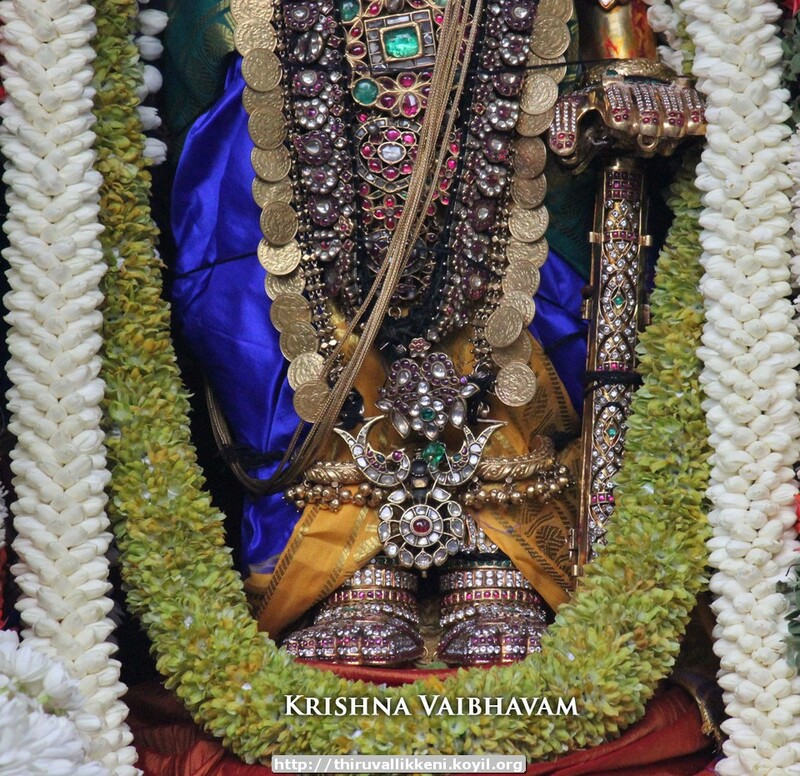 thaN thuzhAyAn – he is the one who is beautiful to look at with his thuLasi garland. Isn’t he the one who is like a mother to everyone! adikkE – just as the calf forgets all other parts of the cow’s body and reaches for the udder [which sustains it], the heart will also forget all other divine limbs of emperumAn’s divine form and hold on only to his divine feet. It will hold on to the divine feet of the only entity who is fit to be attained. thAy nAdu kanRE pOl is a simile in this context. This entry was posted in iyaRpA, mudhal thiruvandhAdhi on July 9, 2017 by T N Krishnan.